﻿ IPXON USA Datacenter Services, +20 POPs in Latin America. Register your own domain name with us. We are specialists in register, transfer and manage domain names. Ensure the privacy and security of your customers with a wide variety of SSL certificates. A powerful network of proxy servers distributed worldwide to enhance your projects. VPS SERVERS IN MORE THAN 20 COUNTRIES. Implement your projects in more than 20 countries with the help of our infrastructure. Dedicated servers in key locations where your projects are growing. Choose the location of your servers and remain close to your businesses at all times. Run your applications from strategic locations for your company. +20 PRESENCE POINTS IN STRATEGIC LOCATIONS. 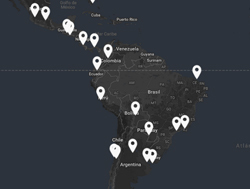 Take advantage of our large network and more than 20 points of presence in Latin America to skyrocket your website performance. A world class PBX. Increase your productivity with integrated high level communications. We work with leading brands worldwide to ensure optimal performance of our infrastructure. Our staff is comprised of highly efficient people. Best support and fast solutions are part of our motto. Presence© platform is a large network with +20 POP´s in worldclass datacenters TIER geographically distributed in strategic cities. IPXON Networks has more than 10 years of experience in the telecommunications industry as specialists in high performance solutions for different types of companies. Throughout this time we have developed one of the biggest Cloud infrastructures in Latin America along with exceptional products to meet our customers most advanced requirements. Copyright © 2019 IPXON Networks. All rights reserved.